This is your personal invitation to the 20th Anniversary Small Paws Rescue Bichon Bash and Retreat Weekend! The 2018 20th Anniversary Okie Bash is Coming this fall! Can You Believe It? It’s Our 20th Anniversary! of October 19th and 20th, Friday and Saturday nights! The sleeping room rate,including two HOT BREAKFASTS SERVED IN THE DINING ROOM, per room is $109.00 per night for all rooms. You may also reserve Thursday night, October 18, 2018 for the same price of $109.00 if you want to come in early! 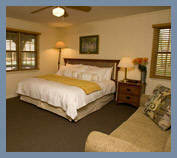 This is how to make your reservations for sleeping rooms in the bungalows at the beautiful Post Oak Lodge!! Tell them you are with Small Paws Rescue. All of the reservations need to go through the front desk. The lobby of the main lodge. A porch and gathering place of one of the bungalows. Have your morning coffee out here! See More Photos of the Beautiful Accommodations! This is one of the sleeping rooms. High thread count linens and down comforters. High speed internet in the rooms, as well as cable TV. The room rate, including 2 HOT BREAKFASTS PER ROOM SERVED IN THE DINING ROOM, is $109.00 for all rooms. This is one of the sleeping rooms with two beds. There are eight total bungalows. Each bungalow has it’s own living room, dining room, a kitchen with fridge and microwave. Cabin 1, (Yes all of the Cabin 1 stories you’ve heard are true! What Happens in Cabin 1 STAYS in Cabin 1!) has10 sleeping rooms upstairs and 8 sleeping rooms downstairs. Each sleeping room has a TV and there is a big screen flat screen TV in the living room of each bungalow. Yes, you can share a room with two queen sized beds with a friend and split the cost. If you are really friendly, you may have four in a room. “Our comfortable and tasteful lodge is comprised of 60 executive-class sleeping rooms, both single and double occupancy. Along with amenities such as irons and hair dryers, all rooms have complimentary high-speed wireless and secure Internet connectivity, a study area and telephones. The common areas in our 2 Executive lodges include pool tables, shuffleboard, and card tables as well as a TV and DVD for evening enjoyment and relaxation. Each lodge has a kitchenette with refrigerator, microwave, coffee pot and ice maker. Several rooms are handicapped accessible. For those who want to keep in shape, our workout facility is available 24 hours a day., and guests can always explore the woods or climb the hills using the many available trails. 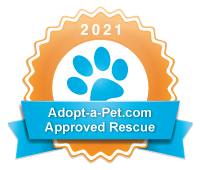 There is a refundable pet deposit required from each person with Bichons of $50.00. There will also be a Bichon Costume Contest by the lake on Saturday during our picnic, so bring your dogs and their costumes! Another view of one of the sleeping rooms. The room where we will have our banquet on Friday night, October 19, 2018. The price for the banquet dinner will be $28.00. and your dogs will be right there, on site, safe in your bungalows! Let the lodge know in advance of any food allergies or if you are a vegetarian. This is where we will have our Saturday picnic, by the lake. 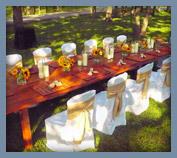 The price for the picnic meal will be $18.00. There will also be a Bichon Costume Contest by the lake on Saturday during our picnic, and bring your dogs! Dale and “Reagan” Pressnall at the 2011 Okie Bash Picnic! The Barbecue Dinner down at the Covered Pole Barn will be Saturday Night at 6:30 P.M. The cost of dinner at the poll barn will be $25.00. Bring your dogs! We will have heaters if needed! The “You Betcha I’m Coming In Early!” Itinerary! Usually, about 25-30 of us arrive early in time for dinner together on Thursday night! This is a great time of fun and fellowship which kicks off our fun filled weekend of good friends and Bichons! We will be going out to dinner Sat 7:00 P.M.
for anyone coming in early on Thursday evening, October 18, 2018. The “local not a chain” restaurant is yet to be determined. The next morning is free time, then we will go to lunch together on Friday, October 19th at 12:00 P.M. at a local restaurant to be determined. Friday afternoon is free time for shopping. There will be cars and many of you love to go to Southern Agricultureto shop! on Friday Night, October 19, 2018. It will be NICE! If you need to be picked up at the airport, we will have someone come and pick you up and take you out to Post OakLodge! If you need a ride to and from the airport, please contact me at robin@smallpawsrescue.org. So Ya’ll come to see us if you can! as well as dogs who are aggressive to other dogs. Dogs who are known biters or aggressive to other dogs will not be allowed lodging at Post Oaks Lodge . This is for the safety of all of the attendees, employees of Post Oaks Lodge, and for the safety of the Bichons.